Another GBBF acquisition today, chosen from the shelf to accompany some pasta and reward myself after a hard morning of pretending to tidy my flat – Baladin Isaac. Teo Musso is a name that I’d heard before and a little bit of poking online reminded me where – other than being one of the most influential Italian brewers and just generally a pioneer of craft beer making, he is the Te- part of Teku, a glass designed to be the ISO wine glass equivalent for the analysis of craft beer. The -ku is Kuaska (aka Lorenzo Dabove), the Italian beer expert who, as one of the Bières sans Frontières organisers, is probably behind the excellent selection of beers from his homeland appearing at the GBBF. In classic sods law fashion I didn’t use one of my Tekus to try the beer. Fail. 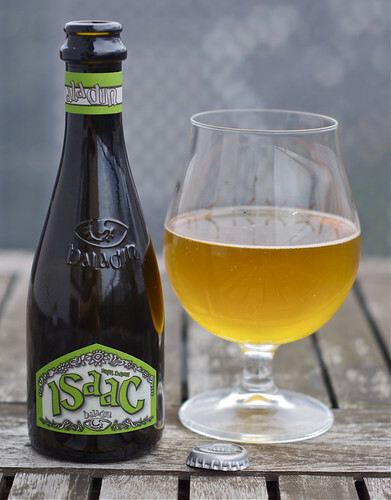 Named in honour of Teo’s son, Isaac was the first in their line of Birra Speziate – spiced beer. The spice in question is coriander, with the addition of Sicilian Oranges also listed on the label. They even have an ‘explanatory’ video up on YouTube for the beer – expect gratuitous Teku, the chopping of mozzarella with an axe, chickens and the substitution of beer for a steering wheel. 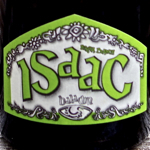 I think the message is ‘Isaac pairs well with mozzarella’. Maybe. It poured quite flat, and on the nose I got the coriander, along with some buttered toast and nutmeg-led ground spice. To taste it was very soft and sweet, with the buttered toast and coriander from the nose joined by milky Cinnamon Grahams and some dried orange peel. On the finish there was a light touch of green hop and bitter citrus peel, balancing lingering coriander and butter, with a touch of sweet orange.